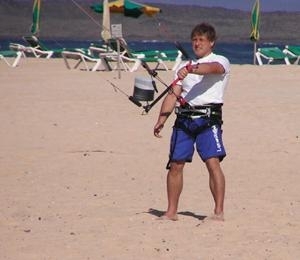 Kitesurfing / Kiteboarding is an extreme and exciting sport . And there is now a full time Kitesurfing School giving kitesurfing lessons daily on the North Wales coast. Run by Steve Jones IKO Level 2 Senior Kitesurfing Instructor and based in Kinmel Bay where there is 3 miles of quiet Beach, North Wales Kitesurfing is the perfect place to take your 2 Day IKO Level 1 Kitesurfing Lessons which are running throughout the season up to the end of November. We also offer Personal kitesurfing lessons, Kite and Board hire, IKO Level 2 Kitesurfing Lessons, and Kitesurfing Fitness Training.